Uncategorized – Jessica L. Knott, Ph.D.
a short road or highway that connects two longer roads or highways. Origin stories are funny things – often when we take a moment to reflect on how we arrived at a certain summit in our lives, we find a circuitous path that may be shocking to even us that we were ever able to walk it. As your OLC Innovate 2018 Conference Co-Chair Emerita, we’ve spent much time brokering meaningful connections between colleagues, and carving new channels for initiatives and opportunities for engagement. We’ve done it (and luckily, continue to get to do it) with genuine passion and joy. And yet, when we share with folks that the two of us are introverts to the bone, we are often met with consternation and protests. How is it possible that two gregarious and earnest colleagues might lead this double-life as introvert connectors? Let’s break this revelation down with a little etymology exploration. The term introvert takes its roots from the Latin “intro-” and “-vert” which most closely translate to “inward” and “turning” respectively. Typically, when folks think of introverts, they think of shy and reclusive individuals that are scared of crowds and attention. Within human personality theory, introverts are classified as individuals who lose energy from interactions with others. This energy is replenished by solitude and time away from external stimulation. Conversely, extroverts gain their energy from crowds and external stimuli, thriving in environments with people and attention. The terms introvert and extrovert can also be used as transitive verbs, delineating between the act of concentrating on oneself, or oppositely focusing on the outside world. Reflecting on these labels shines a light on the fact that they are not binary truths, but rather, theories of personality. For instance, the term ambivert classically describes a person who is neither an introvert or an extrovert. We, however, like to think of it as a broader classification of all of the social interactions that occur, with each interaction plotted on a line with introversion and extroversion at the two poles. Ambiverts comfortably move along the entire spectrum of introversion and extroversion, with that movement controlled by themselves at times, and at other times by others who push or pull them along the spectrum. Think of those times that you “stepped up to the plate” or that you were moved out of your comfort zone. Ambiversion is a truer indication of how we might describe our interactions en masse rather than lumping them into one discrete category. And the binary logic of “you’re either THIS or THAT” just doesn’t hold up in the real world. Similarly, the way that connectors are described quite often carries stereotypes of “social butterflies” and “people person(s)” – individuals who thrive in environments where they can network and collaborate. In actuality, having the ability to meet people and make connections does not necessarily mean that a person is driven by the social aspect of connection. Erica Dhawan expanded on Gladwell’s definition of connectors by separating them into different groups – thinkers, enablers and executors. She describes thinkers as the people who explore and curate ideas, enablers as the individuals who build spaces for communities to grow, and executors as the people who tie people and resources together. You may have read Gladwell’s definition of a connector and not resonated with it, but with Dhawan’s elaboration, does your answer change? Are you perhaps one of these other types of connectors – linking ideas or spaces or resources rather than people? Cruising up to 30,000 feet, the view from above is that we still struggle under the weight of labels, both those that we assign ourselves and those given to us by our colleagues and friends. These labels are not inherently harmful, but if they drive our actions, they can limit our propensity to connect, collaborate and meet our goals. Something that surprises almost everyone is to learn that the two of us are introverts who believe in connection and conversation. “But you’re so outgoing!” Yes, we are. But it’s also a challenge. We write this blog post as a reminder that just because you don’t see yourselves as extroverted, or feel like you have important things to say – you’re wrong. You do. And, in recognizing our shared commitment to collaboration and a culture of gratitude, we wanted to reach out with our story and this message. Behold: the secret life of introvert connectors! Leadership, whether in conference settings or at your our own institutions is not about focusing on the same couple of stars in the constellation. For example, you can spot Orion and its major shape, but there is no Orion without the twinkle of the whole of the stars that create the experience. Conferences and other on-site professional development opportunities should unfold like a visit to the planetarium, the goals and outcomes of which differ for everyone. Maybe you’re really interested in the bright stars you admire regularly. Or maybe you’re more interested in how the universe links together, with stars and connections as the foundational building blocks. There is no right answer. Everyone seeking knowledge belongs, and we encourage you to draw the map that works for you while acknowledging the important role you play as individuals that build the whole. Build a culture of gratitude around you. Jobs are hard, and education is no different. We’re called to teach and empower and that’s at once a heavy load and an incredible blessing. Look for the gratitude around you. Thank those who help you, tell those you admire that you admire them, and try to recognize all that you have to offer others. Conversely, don’t let yourself be overshadowed or diminished. Hold your space and find those who will help amplify your message. Find conference or PD event planners and ask how you can help. Conferences, and professional development experiences in general, are a very heavy lift. The people working with the folks at OLC are often volunteers, and involved for the sole rewards that come from helping others. Don’t be afraid to ask how you can help. Sometimes the answer may be “I don’t know” but that’s also an opportunity. Try using a proposal format. “Hi, X, I love what the Innovation Lab is doing this year, and I wondered if you had any interest in some help formatting the handouts?” While the number of discounted registrations is finite, the desire for many voices and contributors is endless. If you don’t hear back from your query, try reaching out to the OLC conference staff. They’re great connectors and love to hear from you. Stay in touch with folks in deeper ways. Some of you may have seen the #SquadGoalsNetwork hashtag, or may still be following the #OLCInnovate one after your conference experience. Try setting up Zoom calls, or starting some cross-institutional projects and initiatives with the people you met onsite. Travel funds are often limited, but don’t forget the power of face time (even if it’s on an iOS device and not breathing the same air). Keep the conversations going, make something together, or just meet to chat. Virtual happy hours are a fun and easy way (timezones pending) to keep the conference connections and conversations going. That’s the most important part: whatever modality you choose, keep those conversations going and growing. And then use your travel funds strategically to connect and strategize! Camp counselor gear aside, you’ll be able to find us in the Speed Networking Lounge during a networking break, at the Field Guide Kickoff, or at the Women in Digital Learning Leadership Lunch. We’re also presenting on our work that we’re currently doing, including on establishing students as epic heroes in online courses in a Tuesday pre-conference workshop. Additionally, learn more about our efforts to connect people within and beyond conferences in networked practice on our website Squad Goals Network. We created a framework that maps how to move from your conference connections to collaborations outside of the conference and then BACK to the conference to share your work. It’s a model that has been essential to our work, our professional development, and our overall well-being (*signing* We get by with a little help from our friends!) And we felt compelled to share this framework with our colleagues as an OLC Effective Practice that you can use and share with your network. All in all, we’d love to carve out new ways to collaborate. Please find us! Talk to us! Connect with us! Introverts or no, we’re proud to extend ourselves for the greater good of connecting as many stars in the constellation as we can. It’s in this work that all can see that we’re better and brighter together. Angela Gunder (Director of Instructional Design and Curriculum Development, The University of Arizona) and Jessica Knott (Learning Design Manager, Michigan State University) are the OLC Accelerate Enthusiasm Co-Chairs, leading the Speed Networking Lounge and helping to organize the Women in Digital Learning Leadership initiatives. 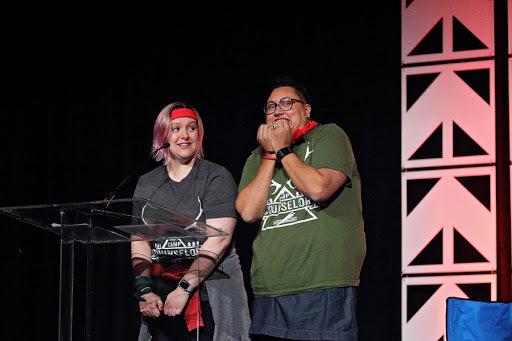 They were the OLC Innovate 2018 Conference Co-Chairs, and frequent OLC co-conspirators on such initiatives as the Technology Test Kitchen, Innovation Lab, and the OLC Institute. You can find them on Twitter (@angelagunderor @jlknott), on their websites (Squad Goals Network and Monomyth Online), or on their respective couches playing iPhone games and eating cold pizza. On April 5, the women of #3Wedu traveled to New Orleans, Louisiana to facilitate a round table discussion on ways to re-define education to support women in innovative contexts. News, blogs, and panels are filled with horror stories from Silicon Valley, reflecting pay gaps, gender bias, and more. In our roundtable, we first asked “what does it mean to be a woman in innovative education environments?” Next, we thought about how we might re-imagine the organizational structures of universities to be more supportive of women. Click here if you would like to review the discussion notes. In this episode of the #3Wedu podcast, we’ll reflect on the roundtable: who we met, what we heard, and ways we might move forward. Join us, April 26, at 6 PM EST/5 PM CDT/4 PM MST/3 PM PDT. Click here to review the show notes.